↑ "Klinefelter Syndrome". Eunice Kennedy Shriver National Institute of Child Health and Human Development. 2007-05-24. मूल से November 27, 2012 को पुरालेखित. ↑ GBD 2015 Disease and Injury Incidence and Prevalence, Collaborators. (8 October 2016). "Global, regional, and national incidence, prevalence, and years lived with disability for 310 diseases and injuries, 1990-2015: a systematic analysis for the Global Burden of Disease Study 2015". Lancet. 388 (10053): 1545–1602. PMC 5055577. PMID 27733282. डीओआइ:10.1016/S0140-6736(16)31678-6. ↑ GBD 2015 Mortality and Causes of Death, Collaborators. (8 October 2016). "Global, regional, and national life expectancy, all-cause mortality, and cause-specific mortality for 249 causes of death, 1980-2015: a systematic analysis for the Global Burden of Disease Study 2015". Lancet. 388 (10053): 1459–1544. PMC 5388903. PMID 27733281. डीओआइ:10.1016/s0140-6736(16)31012-1. 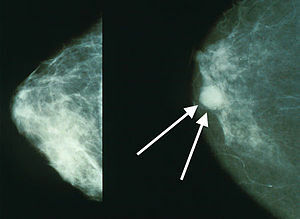 ↑ "Breast Cancer". NCI. अभिगमन तिथि 29 June 2014.